Razer Nari Ultimate review: "A revolutionary step forward in immersion"
The Razer Nari Ultimate paves the way for the future of gaming headsets, with a level of immersion you never thought was possible. Razer has ushered in the dawn of a new era for gaming headsets with the Nari Ultimate. Using intelligent haptic technology developed with German engineering company Lofelt, Razer has discovered a new frontier when it comes to creating the most immersive sensory experience you've ever had the pleasure of receiving. The $200 wireless headset is a little on the pricey side, and there are a few bugbears I have with it that would make me think twice about getting it at that price point, but the revolutionary HyperSense technology is almost enough to make me throw caution to the wind and stuff handfuls of crumpled bills into the pockets of the sales assistant at my nearest retailer. In fact, if you have 20/20 vision, and a bigger head than I do, you should do just that. If you're in the market for a new headset and want to keep your options open, check out our round-up of PC headsets for gaming, PS4 headsets, and Xbox One headsets. The Razer Nari Ultimate's elegant design encompasses a gunmetal finish metal frame floating above the flexible, adjustable band. The auto-adjusting headband is intended for a "fuss-free fit" but if you have a head that errs on the small side, it'll feel like someone has slung a saddlebag over your ears. Whilst the headset is lightweight, the sizeable cups sagged below my jawline, and felt like they were resting against the side of my head as opposed to cupping my ears. This also had an adverse effect on the eyewear channels - a feature to accommodate those of us not blessed with 20/20 vision. Because the cups didn't have an ideal fit, the indent wasn't aligned properly, and I couldn't comfortably wear the headset for more than an hour with my glasses on. But then, I do favour a more snug fit for my headsets, and perhaps I have an abnormally small skull. This isn't going to be a complaint for everyone, but if you're on the daintier side, it's something to consider. With contacts, the headset still felt like an annoyance when I first put it on, but I did get used to the fit after a while. The swivel earcups are made up of memory foam, cooling gel-infused cushions, and plush leatherette rims finished with heat-transfer fabric, so you can sweat away to your heart's content, although make-up wearers will struggle to get the cups completely clean if there's any transfer of foundation. All-in-all, the Nari Ultimate is pretty to look at, will be comfortable to wear for most, and you can even jazz them up a little thanks to the Razer Chroma support. Using the Razer Synapse 3 software, you can choose between Static, Breathing, and Spectrum Cycling lighting effects so anyone looking at you while you're gaming can enjoy a mini light-show. Outside of the HyperSense technology, and THX Spatial Audio support, the Nari Ultimate has a number of snazzy features, but they won't please everyone. Let's just rip the band-aid off right now; there's no wireless support for Xbox One at the moment, and the Game/Chat feature only works with platforms that support wireless mode. On the plus side, it has wireless support for PC and PlayStation 4, and has a Game/Chat dial to let you drown out your teammates as you see fit. The headset has a mute button, retractable boom arm mic with a little flexibility that has a mic mute indicator light at the end, but the absence of a mic monitoring feature is a bit of a letdown. The earcups house 50mm drivers and include hidden indented eyewear channels for glasses wearers, but they're not nearly as pronounced as the Turtle Beach's ProSpecs alternative, seen in the Stealth 300. The headset wasn't a great fit on me, so I missed out on the benefit of the channels, but even running a finger along the foam, the indent is barely discernible from the rest of the ear cushion. There's a wireless USB dongle that pops out of the right earcup with a firm push, and you can slot it into your PS4 or PC to get going. There's also a 3.5mm port, and a wired USB connection that allows for charging, even when the headset is in use. To tweak the RGB lights on the earcups, or the intensity of HyperSense, you can use the Razer Synapse 3 software suite to set up lighting effects, and enable/ disable the haptic feedback, or customise it to your liking. Your preferences will save and carry over to any device you subsequently use your headset with. If you're connected to a device via the 3.5mm jack, you can just turn the power off to disable HyperSense. All of those nifty features will take a toll on the Razer Nari Ultimate's battery life. You can expect 24 hours with the RGB and HyperSense turned off, and eight hours with them both enabled. On the bright side, it only takes four hours to juice up the headset again. The standout feature that sets the Razer Nari Ultimate apart from anything on the market right now is the HyperSense haptic technology, which I could gush about for days. The L5 haptic drivers work on a wide frequency range of 20Hz-200 Hz, and use dynamic Digital Signal Processing (DSP) to create an immersive, lifelike experience. The drivers act independently of one another, so depending on the action in-game, you'll feel the tactile feedback adjust, getting weaker in one earcup and stronger in the other for example, as you move around the environment and encounter various noisy things that populate the world you're inhabiting at the time. From a sound perspective, the Nari Ultimate offers great performance for gaming, but is a little lacklustre on the music front if you listen without the haptics on. Playing Doom, Overwatch, and God of War, voices were clear and there was an amazing level of clarity, with creaking bridges, rustling wind, and crackling fires just as discernible as burning wreckage, demons' battlecries, and distant gunshots. 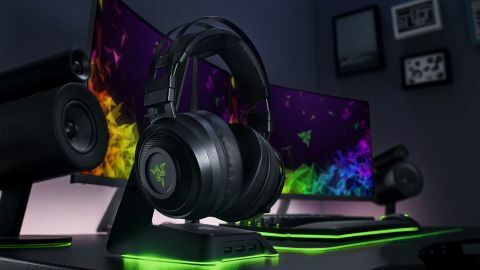 Razer has made it clear that the headset has been designed with immersion in mind, first and foremost, so it may not be ideal to give you an edge in competitive gaming. The bass is certainly helped, along with HyperSense, giving a feeling of a more robust sound than there actually is, and lends an extra dimension to your entertainment, making movie-lovers and gamers the ideal audience. And if you're into ASMR, boy howdy, are you in for a treat. Pop these on with an ASMR Zeitgeist video, and you'll be in heaven. While audiophiles might see the Razer Nari Ultimate's HyperSense haptic technology as a gimmick, from an entertainment standpoint, it's truly a game-changer. The bass is decent enough for games and movies, but coupled with HyperSense, you'll get an added dimension you won't find anywhere else. Competitive gaming aside, the clarity is perfect for the ambience of single player games like Horizon Zero Dawn, or God of War, and the addition of HyperSense makes for a rich, deep, rumbling base you can really feel, and it's that experience you're paying for with the $200 price tag. Razer is also offering the Nari for $150, which is the same as the Ultimate minus the haptic feedback feature, but without it, you could probably find a better alternative, like Razer's own Kraken Tournament Edition for under $100 with THX Spatial Audio support and adjustable bass. You can also pick up the Nari Essential for $99.99 although it has significantly less features than its siblings. Ultimately, if you're looking to take your home entertainment to the next level and have $200 to spend, the Razer Nari Ultimate really is a transformative experience. From powerful, face-melting explosions to the distant, cheek-jiggling rumble of an approaching vehicle, the Razer Nari Ultimate plunges you into another world, and you'll never want to leave. You can buy the Razer Nari Ultimate for £199 in the UK. You can buy the Razer Nari Ultimate for $199 in the US. UPDATE: Razer has confirmed that the headset will have mic monitoring enabled via the Synapse 3 software when it launches later this year. The feature was absent from the review sample.